Authored by Medical/Surgical and Critical Care Nurses with over 60 years of combined experience in both practice and academia, these books reflect the teaching expertise of and time-tested instructional tools developed by these leaders in the field. 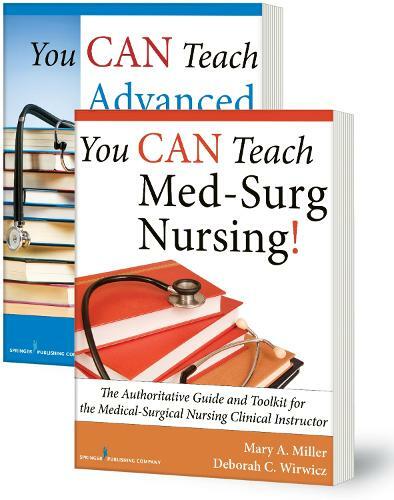 You CAN Teach Med-Surg Nursing! is the first comprehensive resource for clinical medical-surgical instructors responsible for guiding students through their entire clinical rotation. Containing everything the new or adjunct instructor needs to teach expertly and confidently, the guide describes the role of medical-surgical instructor and provides an introduction to the clinical site. It features a week-by-week instructional plan for the clinical rotation and includes all materials necessary to effectively perform administrative leadership and supervision, assess students' knowledge and learning styles, maximize the learning process, simplify evaluation, and help ensure a smooth transition to clinical practice. Included are Organizational Teaching Templates, Course Syllabus, Comprehensive Skills Checklist, Medication Guidelines, Patient Teaching Resources, Pre- and Post-Conference Expectations and Activities, PowerPoints, Simulation Scenarios, Quizzes, Critical Thinking Exercises, and more. You CAN Teach Advanced Med-Surg Nursing! is written specifically for nurses teaching Med-Surg II. In addition to providing the comprehensive resources included in the companion guide, it offers detailed strategies for dealing with challenges faced by the first-year instructor, including case studies and clinical pearls. A sample course syllabus and a week-by-week instruction guide ease the workload for a new instructor with their Organizational Teaching Templates, Teaching and Learning Resources, and Evaluation Materials. Additionally, the book provides an Adjunct Faculty Contract, Care Plan and Medication Forms, Make-Up Assignments, Tables, Pre- and Post-Conference Preparation, and Interactive Student Activities. A chapter on career goals and planning helps the instructor to guide students in their job search and in preparation for the licensing exam.